You can gauge the grimness of a film by the number of jokes you hear once the lights go up. Not jokes made at the film’s expense, but to lighten the mood. “Well, that was a laugh-riot…,” et cetera. When Yol ended, I heard a lot of people trying to be funny. I worry this will deter you from seeing Yol. 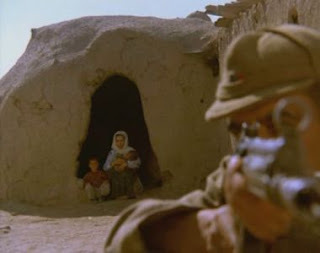 I might further deter you by telling you the movie is old: made in 1982, and subtitled: spoken in Turkish and Kurdish. It is melodramatic, at times shamelessly so; its performances are sincere but archetypal; its dialogue, expository. But it is also a righteous masterpiece, containing one of the cruelest sequences I’ve ever seen on film. It is profound and unsparing in its tragedy. It should not be missed. 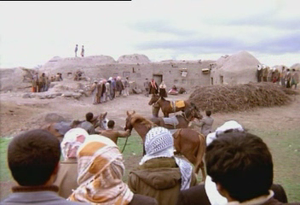 Turkish director Yilmaz Güney created Yol by proxy, while a prisoner. He managed to smuggle footage out of his country and into Switzerland, then on to France, for editing. Appropriately then, his subject is imprisonment and freedom: the stories of five Turkish convicts, each serving a long sentence, and each given a week’s leave, over the course of which they must travel back to their homes and assess the damage. The damage, for several of them, is great. The convicts’ week out is not a vacation, but a brief window within which to conduct necessary business. Nor are they ever, really, free. Güney portrays Turkey as a police state, in which obeying the law is more a matter of self-preservation than proof of good character. This is made clear in a remarkable early scene, when one of the convicts informs soldiers that he is, in fact, a convict, then sits comfortably among a crowd of commuters, several of whom bum cigarettes off him. They seem unfazed; as though he’d said he was a dentist. Imagine a similar situation here. Following rules is an end unto itself. One of the men loses his papers and is immediately locked back up. Sorting this out may take the entire week. The man hasn’t seen his wife in years. “You shouldn’t have lost your papers,” says a soldier. Another man, a Kurd, trudges home to the Syrian border, where different soldiers (but the same, the same), shoot villagers almost daily. The first thing he hears when he arrives is the pound-pound-pound of gun fire. Having never heard this in real life, I thought it sounded almost domestic—like a very loud sewing machine. It so happens that we hear a real sewing machine soon after, sounding almost as ominous, greeting a convict who returns to a family that does not want him. His cowardice led to his brother-in-law’s death, we learn. His wife (running the sewing machine) must choose: go with her husband and children, disgracing her family forever, or turn her back on him. This is her choice, but not her rules. Her own father and brother make it clear that, if she forgives her husband, she’s as good as dead to them. This is deep misogyny. We get, loud and clear, that the plight of women here is no easier than it is for men, and in some ways, is far harder. It is not enough that women suffer too; they must also justify mens’ suffering by staying pure—maintaining the promise of a happy home so that convicts may fantasize about returning to one, some day. Yol’s central story, concerning the convict Seyit Ali (Tarak Akan) and his wife Ziné (Serif Sezer) takes this to the extreme. In this story, the wife has fallen. She prostituted herself in her husband’s absence, and her life is forfeit. Seyit Ali set out on a five-hour winter trek, on foot, with a weakened wife in tow, and he gave her practically nothing to wear. That is murder. And yet, he had been the film’s noblest character up to this point: tall, quiet, firm in tone and bearing. We are conflicted. We have pity, in abundance, for the wife, but even a bit for the husband, because we know that he too has been offered a hideous choice, and because, as a man with a heart, somewhere, he will be crushed by guilt and regret, should his wife succumb. It is an epic scene, multi-faceted; detailing a total failure of human nature. Seyit Ali and Ziné both broke the rules. His crime put him in prison; hers made her a pariah. But when they try to follow the rules, they risk destroying themselves and each other, at least emotionally, and perhaps literally, too. Everyone in Yol, then, is a victim, including the perpetrators and persecutors. Everyone’s life is tenuous when privacy counts for nothing and the misdeeds of the few are blamed for the failings of the whole. Yol depicted places unfamiliar to me, filled with men and women in circumstances I found alien and hard to fathom. But I was unable to remain an outsider. The film accepts no passive viewing—to even try, we have to close our eyes not just to Güney’s society, but to our own. Bigotry, zealotry, misogyny, even so-called ‘honor killings’, are still with us. The fight against them must be constant, and we must all be part of it. So start by watching this film. Yol screens at 6:30 pm, Saturday, January 28, 2012, at Toronto’s TIFF Bell Lightbox—part of The Way Home: The Films of Turkish Master Yilmaz Güney, an eight film retrospective showcasing Güney’s work. The retrospective, which also includes The Hungry Wolves (1969), Hope (1970), and Elegy (1971), runs from January 26 to February 5.